One of the things that has always confused and amused me is a maiko's willingness (or unwillingness) to smile for a portrait. ... and then watch her clamp her mouth shut as she realizes what she is doing. In my early days, this confused me. I probably even stopped a few times and asked the maiko if there was something wrong, which was a pointless question. If there really had been something wrong, the maiko would definitely not have told me. Maiko and geiko know never to say anything that might upset a client (which is one of the reasons I have always tried to get them to not think of me as a client). 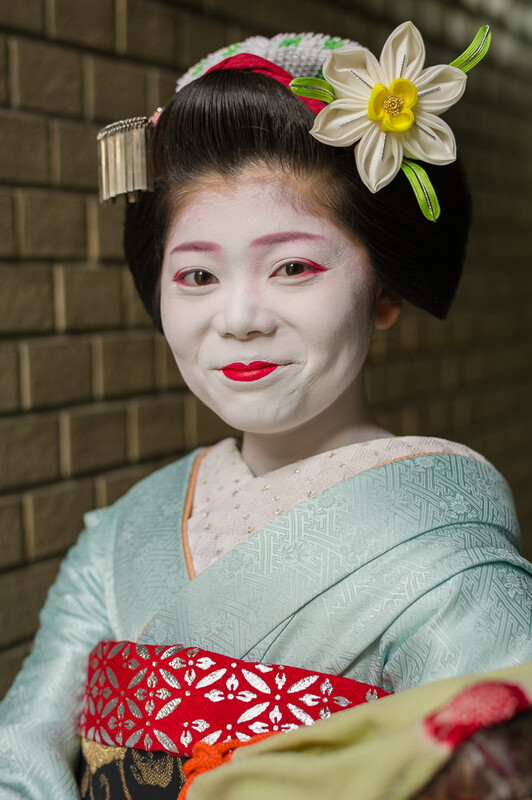 Over time, I came to understand that the maiko would try not to smile because they believed I didn't want them to smile. They were trying to please me by not smiling because they thought this was what I wanted. In other words, they thought that smiling was inappropriate, so they stopped themselves. Of course, they were make assumptions about what I wanted and what was appropriate based more on their preconceived notions, not mine. One of those preconceived notions is that a "formal" portrait should be serious. After all, how many famous portraits (paintings or photographs) portray the subject smiling? The Mona Lisa comes to mind, but her smile cannot be classified as a big, toothy grin! Another reason is that Japanese never smile for certain photographs like the ones that go on a passport or a person's CV (known as shoumei shashin in Japanese). In fact, I think the worst photos I have ever seen are the photos on the resumes of my Japanese friends. They look completely miserable and nothing like the real people I know. Finally, most people don't really like having their photograph taken. It can be uncomfortable and intimidating, especially when there is a long lens on the camera and a lot of lights and equipment and a tripod. I feel the same way. Part of my job is relaxing my subjects, whether they are maiko or anyone else. On other occasions, I just explain. Last November, I was photographing Yuriha and Tatsuha for the first time since their debuts last January. When I photographed them one at a time, both of them clamped their mouths shut at first. I just told them that if they felt like smiling, they should smile. If they didn't, they shouldn't. I just want them to be themselves and feel whatever they are feeling at the time. They can't do anything wrong. With a little coaxing, their personalities reveal themselves, sooner or later. Without a doubt, my all-time "I don't want to smile" champion is Momifuku, whose almost-smiling portrait is posted here. Momifuku didn't really enjoy being photographed until the very end of our time together, which is odd since she gave me more access to her life as a photographer than almost any other maiko or geiko. The only way I could get Momifuku to smile was to tell her that our photo session was coming to an end, which was the case here. I was photographing her in the alleys off of Ponto-cho in early March at the beginning of our photo session, and then we were going to take a taxi to Gion Kobu to a teahouse where I had already set up my lights to photograph her dancing. This portrait was taken at the mouth of the alley near where the taxi was waiting for us. I told her this would be the last image I made before we went to the taxi, and she was so happy she almost smiled. Almost!